and take your place in history! 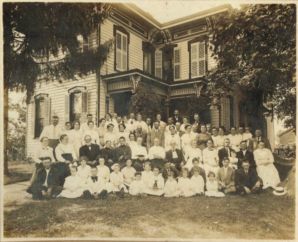 Every year, new photographs, archives and artifacts are added to the Delaware County Historical Society collections through the generosity of individuals, organizations and corporations. 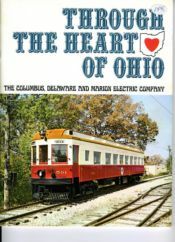 These donations help us fulfill our mission to promote and sustain interest in the history of Delaware County, Ohio, through historic preservation. Items made in, used in, or about or by – Delaware City/County. 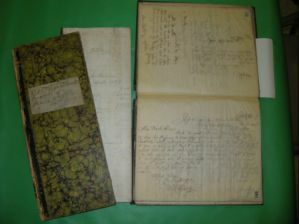 At the moment we are very interested in items from 1800 – 1850. 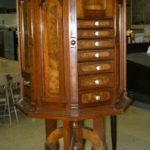 Mr. Nicholas Wagner made this dentist cabinet prior to 1890. Objects: Clothing, toys, tools, furniture, memorabilia, personal items, etc. 1913 photo of the Williams/Lewis family reunion, at the Pugh farm. 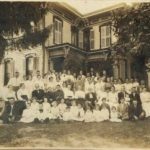 Photos: Especially identified photos but old photos of places in Delaware City/County are very welcome. We may be able to identify some. We are happy to receive photos on loan to digitize and return the lender with a digital copy of the photo. 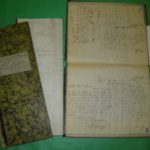 Archives: Records created by local organizations, businesses, government, and reminisces of Delaware City/County residents, unpublished manuscripts, etc. 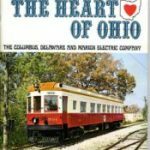 History of the Columbus, Delaware, and Marion electric railway. Does the Delaware County Historical Society do appraisals and will they appraise my donation for monetary value? All donations accepted by the Delaware County Historical Society are considered charitable contributions to a not-for-profit organization. How are potential donations received? Donation offers are reviewed by the Society Collections Committee. The Committee is made up of volunteers and local historians knowledgeable about both the scope of our existing collection as well as the conservation issues associated with artifact care. The Committee sends out a letter of acceptance after the artifact has been reviewed; this process can take from one to four months. Does the Delaware County Historical Society accept long-term loans? The Society does not accept long-term loans unless an exhibit requires such an artifact. The Society often accepts short term loans for specific exhibits or programs; we prefer to commit our resources to the storage and preservation of materials in the collection. If I donate an artifact to the Delaware County Historical Society, will it be returned to me at my request? After an artifact is accessioned and becomes a part of the Delaware County Historical Society collection, it cannot be returned to the donor. Once the Collections Committee accepts your donation for the collection, your Deed of Gift form legally transfers ownership of the artifact to the Society.